2017. By Ronald Dale Karr. 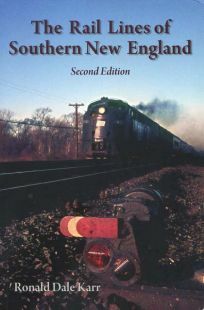 The long awaited new second ediiton of this must have guide and handbook to the common carrier rail lines of Massachusetts, Connecticut and Rhode Island. In this new ediiton, Karr has updated his brief but thorough histories of all of New England's present and predecessor railroads, including info on current status, abandoned sections that have become rail trails, and formerly active track now abandoned. Full of history and illustrated with more than 100 all-new detailed maps and over 100 historical and contemporary photographs. Softcover. 452 pp.